We found ourselves in Wellington during the day on New Years Eve when it was freezing cold & bucketing down rain. After we had enjoyed our first visit to Aunty Menas, we decided to go back for a bowl of laksa to warm ourselves up which ended up being the perfect idea. We were pretty hungry by the time we got there so ordered vegetarian nuggets to start with. I ordered the dumpling laksa. Oh my goodness this was so good. It was absolutely the perfect thing to sit down to while it poured rain outside. It was creamy & mildly spicy & filled with dumplings, tofu & vegies. Greg ordered the mock chicken laksa which was the same as mine but with mock chicken instead of dumplings. He very much enjoyed his laksa as well. We chatted to one of the owners before we left who was very friendly & coincidentally a former Melbournite. I really liked Aunty Menas & will definitely be heading there next time I find myself in Wellington. Greg's family are all in New Zealand & somehow I have never been over there so we decided to go over for 2 weeks for an NZ Christmas. Firstly, let me just say that from the little I saw of New Zealand it is absolutely beautiful. The food I ate was great, the wine I had was fantastic & the vintage clothes shopping is incredible! We were mostly based in Wellington as we were staying with my mother in law who lives in a suburb of Wellington & although we didn't eat out heaps as we cooked for ourselves a lot I did have a few places that I wanted to eat at in NZ. After reading this post by Carla I was pretty keen to check out Aunty Menas, so our first day checking out Wellington we headed to Aunty Menas for lunch. Aunty Menas is based on Cuba Street which is a very vegan friendly part of town & I absolutely loved that part of Wellington. It is a very unassuming restaurant but the sign out the front proclaiming it as a Vegetarian & Vegan Restaurant was a pretty happy sight to see. We were greeted by a brusque, efficient man who advised us that must of the items on the menu are vegan. We ordered, dumplings for Holly, Chow Mee for me & Dumpling Soup for Greg. Holly's dumplings were really good. Steamed & then lightly fried on the bottom & filled with vegetables. Holly loved these! This was so delicious, I want to eat it again now! It was a delicious, charry stir fry of noodles, mock chicken & vegetables. The one vegetable that Holly flatly refuses to eat is broccoli & even she ate the broccoli out of this because it was so tasty! Greg is a big fan of dumpling soup & he really enjoyed this. It looked quite bland when it came out but it was actually quite well flavoured & was filled with dumplings, cauliflower, broccoli & carrots. It has been aaaaaaaaaaaaages since I last blogged due to slackness, tiredness due to non sleeping toddler & general life stuff getting in the way but am feeling a bit inspired at the moment so am going with it! Today was the Planet VegMel picnic (also world fingerpainting day - who would have guessed??) & it really reinforced why I started blogging. To sit in the sun eating amazing food with fantastic people who I would not have met otherwise is a pretty awesome thing. I remember when I was thinking about going vegan & I used to read all these blogs & read about potlucks & it sounded like an amazing little community that I wanted to be a part of & now I am a part of it & it really is an amazing & supportive community. So on to the food. I decided to make rice paper rolls with a peanut dipping sauce after Mandee mentioned them during the week & I could not get them out of my head! Unfortunately these were really bland & boring & I was generally pretty unhappy with them & didn't even take a photo. My dessert on the other hand, I was really happy with. I wanted to make something peanut buttery & when cleaning up my bookmarks I came across an incredibly easy recipe for peanut butter balls so decided to make them. Yum! They were like peanut butter cups in ball form but did end up a bit melty at the picnic. Mix peanut butter, almond meal & maple syrup together until well mixed. Roll pb balls into the chocolate & refigerate until set. And this is what happens after you eat too much & are all tired out from trying to grab food & chase after birds, aka, post potluck nap. 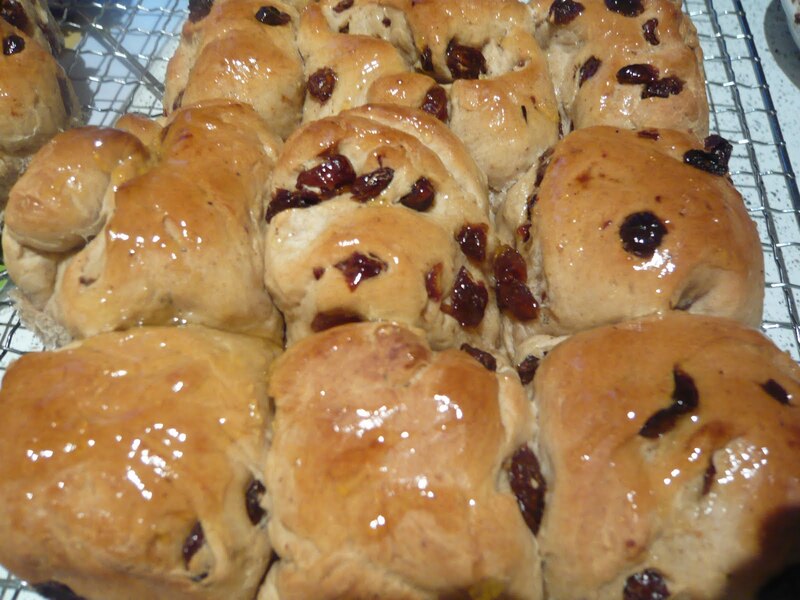 I do like a hot cross bun around easter & haven't been overly happy with the ones that I have been buying so decided to make my own. Many years ago I attempted making them with compeletely disastrous results, they were tiny, hard little almost inedible buns & given that I was veganising an existing recipe this time I wasn't expecting great results. So it was a nice surprise that these were incredibly easy & incredibly delicious. 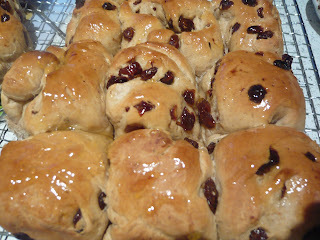 I left the crosses off so made them as plain easter buns rather than hot cross buns. Combine the milk mixture, nuttelex and made up egg replacer in a jug and whisk to combine. Combine flour, salt, mixed spice and remaining sugar in a bowl. Add the raisins and stir to combine. Make a well in the centre. Pour in the milk mixture and use a wooden spoon to stir until just combined, then use your hands to bring the dough together. Bake in preheated oven for 10 minutes. Reduce heat to 180°C and bake for a further 20 minutes or until golden and cooked through (buns are ready when they sound hollow when tapped on the base). Turn onto a wire rack. Place the marmalade in a microwave safe bowl & microwave for 45 seconds or until melted. Brush hot marmalade over the buns. Enjoy with a cup of tea! Last week when I was at work I was after a snack so headed to the supermarket conveniently located next door & spotted the Emma & Tom's Life Bars. 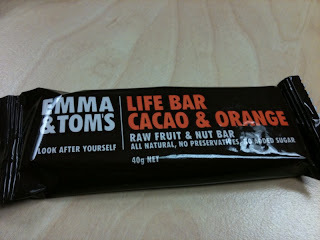 I have never seen these before but was intrigued so bought the cacao & orange flavour. 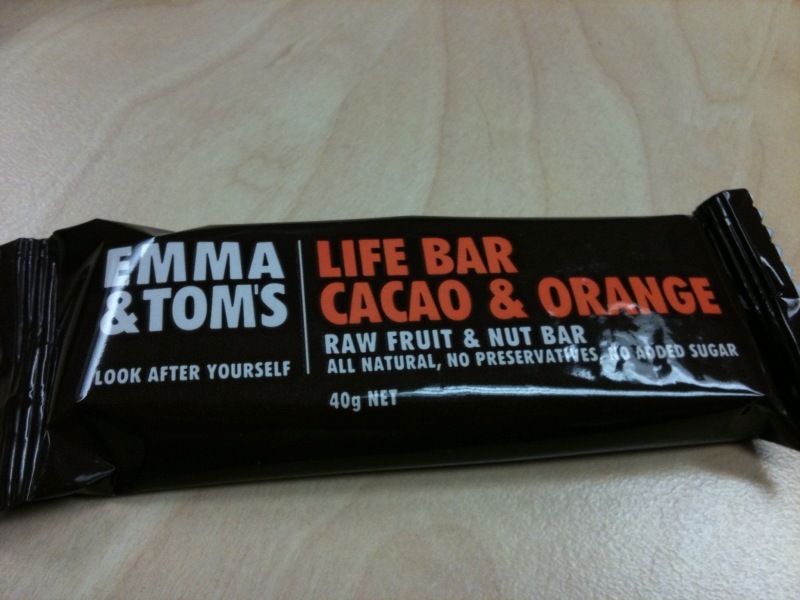 This was so good, like a healthy chocolate bar! It also doesn't have any scary ingredients either, they are - dates, raw cashews, raisins, cacao powder & cold pressed orange oil. But they are a bit on the pricey side at $2.60 each so I decided to try making my own version to take to work for snacks this week. I used figs rather than raisins because that is what I bought at the supermarket & used a tiny bit of orange rind because I only had a quarter of an orange. The orange flavour is not very strong at all but obviously if you use more rind it would be better. I also decided to make balls rather than bars. These turned out well, they are just slightly chocolately & I think they will be perfect afternoon snacks at work. After nearly 11 months on maternity leave (aka the best time ever!) I returned to work last week. I am lucky enough to be only working 3 days a week but it is making me appreciate the weekends again. So this weekend I decided that we should head out to breakfast to start the weekend off in the best possible way. I hadn't been to Las Vegan since the new owners had taken over & Greg has never been so with the lure of pancakes we decided to go there. After much indecisiveness I ended up getting scrambled tofu on rosemary & olive sourdough with tempeh bacon & avocado while Greg got the sour cherry pancakes. 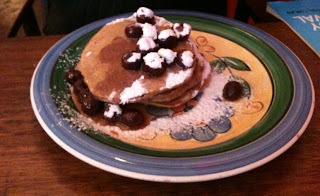 Greg loved his pancakes, they were fluffy & cinamonny & very delicious. The sourdough toast with my breakfast was filled with big chunks of olives & was amazing, I would have been more than happy just to have that toast on its own. But I don't think that the olive & rosemary flavour went well with the curried flavour of the scrambled tofu. I liked both things separately but not so much together. 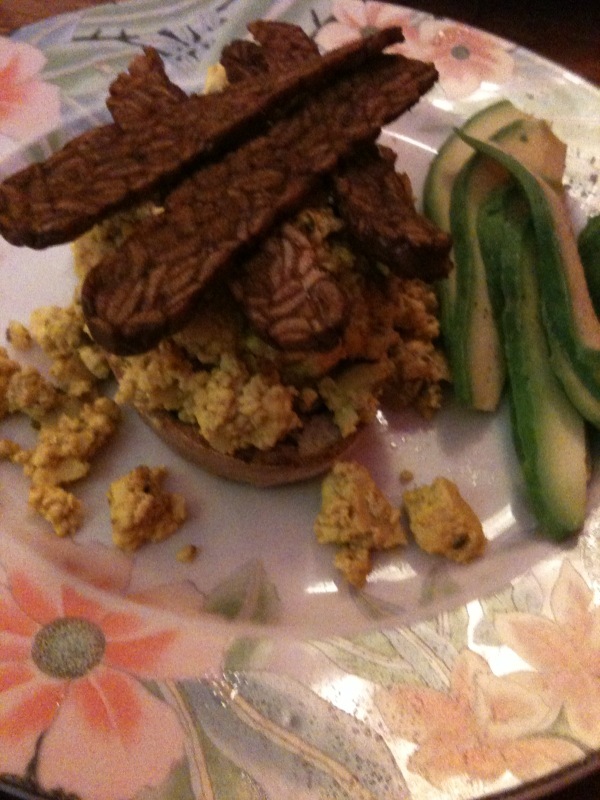 The tempeh bacon was also really, really good & has inspired me to start experimenting with making my own. Overall we did really enjoy our breakfasts & it was a great start to the day. We paid $25 for both meals & a coffee each. They are also quite baby friendly with a few high chairs available. I couldn't find anyone else talking up the Las Vegan breakfast, but others who have paid a visit at other times of the day are Vegan About Town, In the Mood for Noodles & Easy as Vegan Pie. Last weekend Greg & I found ourselves over the west side of town around lunchtime so luring Greg with the promise of wonton soup, we decided to make our way to Bo De Trai. I love Vietnamese food & it is something that I have not gone out to eat much of since being vegan so I have been wanting to go to Bo De Trai for awhile. I was planning on having a wonton soup but it was a warm day & I ended up getting the spring rolls on rice vermicelli. This ended up being exactly what I wanted, not too heavy or spicy but with good flavours. It was plain vermicelli noodles with lettuce, mint, chopped spring rolls & it came with a sauce on the side. Greg went with the wonton soup which he enjoyed. I tried some & it was nice, but featured coriander which I am not a fan of. I am planning on going back soon & getting it without coriander which I think will be really good. It is cheap & cheerful with fast efficient service - what more could you want from lunch?